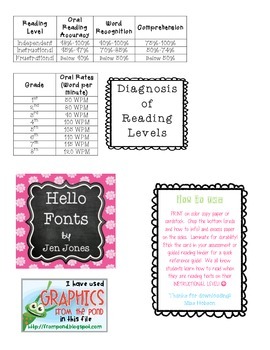 USE THIS CARD AS A WONDERFUL REFERENCE WHILE DIAGNOSING STUDENTS' READING LEVELS! PRINT on color copy paper or cardstock. Chop the bottom (creds and how to info) and excess paper on the sides. Laminate for durability! Stick the card in your assessment or guided reading binder for a quick reference guide! We all know students learn how to read when they are reading texts on their INSTRUCTIONAL LEVEL!